Everyone knows that boys are better than girls at math, that spicy foods upset the stomach while milk is soothing, and that lemmings drown themselves en masse. Likewise, we all believe that strange things happen during a full moon, that people become more conservative as they get older, and that stomach cramps will sink a swimmer who goes in the water too soon after eating. From a research plane high over Wisconsin comes proof that two snowflakes can indeed be alike. From dozens of psychologists comes word that birds of a feather flock together a lot more often than opposites attract. From a laboratory in Ireland comes a brand-new report suggesting that your mother may have been right when she told you to stop cracking your knuckles. From recently declassified government documents comes disturbing evidence that the United States didn’t need to drop atomic bombs on Hiroshima and Nagasaki – the Japanese were already about to surrender. In all, Kohn offers a careful look at about eighty popular assumptions and ends up debunking a good deal of conventional wisdom. In the process, he offers a model of healthy skepticism and provides some valuable analytical tools for evaluating the things we hear. You Know What They Say… is witty and well-researched, packed with surprising facts that readers will soon be quoting to their friends. You Know What They Say…, alas, is officially out of print. 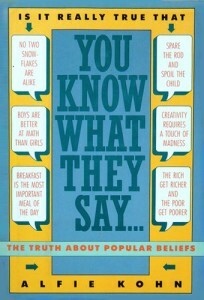 However, Alfie Kohn has a limited number of his own copies available. If you are interested in obtaining one, please leave us a message at the e-mail address listed for questions & comments on the Contact Us page.